The election of a city region mayor for Sheffield city region (SCR) in May 2017 looks unlikely as the whole process could be delayed by months following a judgement in the High Court over the lawfulness of the consultation. In August, Derbyshire County Council mounted a legal challenge against the consultation regarding the creation of the Sheffield City Region Mayoral Combined Authority (CA). The High Court heard the argument that the consultation "was so fair it was unlawful" as it did not include a specific question regarding Chesterfield, currently a non-constituent member, who, like Bassetlaw, signalled their intention to join the Combined Authority. As a proposed devolution deal progresses, a Mayoral Combined Authority is set to be created, building on the 2013 agreement which saw the nine local authorities that comprise the city region create a new legal body with responsibility for transport, economic development and regeneration. The deal includes a new gain share deal within an envelope of £30m a year for 30 years – giving the SCR the power to use new funding to boost local growth and invest in local manufacturing and innovation. In return, the Government will require a directly elected mayor to hold accountability for the new powers. Elections were set to take place as soon as May 2017 and the mayor will chair the Sheffield City Region Combined Authority, the members of which (the leaders of the constituent councils) will serve as the mayor's Cabinet. 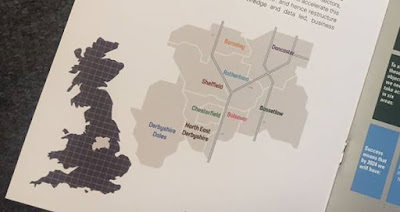 Derbyshire County Council believe that if Chesterfield became a full member of the CA it would "spend the next 30 years living in South Yorkshire's shadow." Lawyers for the county council said that: the consultation made no reference to other potential options for devolution for the region; made no reference that Chesterfield and Bassetlaw would become constituent councils in the new Combined Authority, and could be required to relinquish further powers to it or to its Mayor; that Derbyshire county council did not have significant input into the discussions; and that the consultants carrying out research were not independent. Mr Justice Housley stated: "I have concluded that there should have been a question asking whether Chesterfield BC should be part of the SCR CA. Without it the consultation did not achieve its statutory purpose under s113. That conclusion is based on the arguments before me. "I am not minded at present to quash the consultation since the Secretary of State might decide that he can sustain the lawfulness of the consultation by different reasoning based on all the material he considers. He might decide that only a part of the consultation need to be done again; it is not the whole of the consultation which is unlawful. I will hear counsel however on the appropriate terms of order, including whether there should in fact be a quashing order or declaration on that point. "I have not accepted the other grounds of challenge." Cllr. Anne Western, leader of Derbyshire County Council, said: "The people of Chesterfield knew this consultation was unfair and misleading and this High Court judgment confirms that. "When the county council asked the question Sheffield City Region failed to ask - whether Chesterfield should join Sheffield - more than 7,500 people responded to our online poll (opens in a new window) or filled in postcards in libraries and more than 92% opposed the plans. "Taking action in the High Court was the last thing we wanted to do but unfortunately we were left with no other option to help us defend the right of local people to have their say on something so important. "This is a victory for fairness and common sense and for the thousands of local people who - despite not being able to answer the question they wanted to in the official consultation - spoke up and made their views known loudly and clearly." A spokesperson for Sheffield City Region Combined Authority said: "This judgement confirms that our extensive and wide-ranging consultation will not be quashed. The judgement raised the need to carry out further consultation to address the proposed governance changes in Chesterfield. We will now take some time to consider the judgement and our next steps. We will make further public statements once we have had the opportunity to do this." The draft order that would enable a new mayor to be elected next year was put before Parliament in July but it hasn't got much further. The Secretary of State hoped it would go before Parliament again in mid-December with final steps concluding by the end of January 2017. If further consultation is required, the process would be delayed by two months.